This is the third tutorial of Problem on train aptitude sequences. 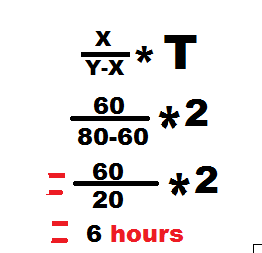 However, this chapter related to the shortcut math chapter Time speed and distance. Though, we have divided it into separate math sections. Because all the examiners are asking the question from Time-speed and distance aptitude with the problems on trains topic. Some primary term can be applied in this chapter. So, this point of view we are discussing in this page related to problems on trains to earn quicker math solution formulas and observe aptitude question quickly. A train started the journey from one station to another station at the speed of X Km/hour. Another train which is started the trip from the same position and same direction at the rate of Y Km/Hour. The second train started travel T hour later from the first train. When will be both trains in the same place from the first train journey? Here must be the speed of the first train greater than the second train. Please note: Here X & Y is the speeds of two train, where X is first the train and Y is other trains. T is the time difference between two trains starting the journey. A train started a journey from the station Howrah to Gauhati at the speed of 60 Km/h. Two hours another train began its drive at the speed of 80 km per hour. When will the second train catch the first train from its started time? Question: A passenger train covers 200 km at the speed of 50 km/h. Another passenger train covers 150 Km at the speed of 30 km per hour. What is the average speed of both trains? Here two distances are 200 and 150km.The speed of two trains 50 and 30 km per hour. Now we will use the formula by putting value.